So visually alluring and tactiley pleasing, our Two-Piece Woven Bag serves as a daily reminder of the beauty in natural materials and handmade objects. 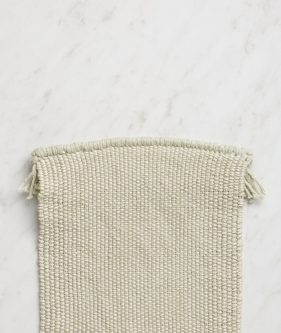 The eponymous “two pieces” are two woven strips that you whip up on Schacht Spindle Co’s Cricket Loom, a super simple rigid heddle loom that fits right on your kitchen table. 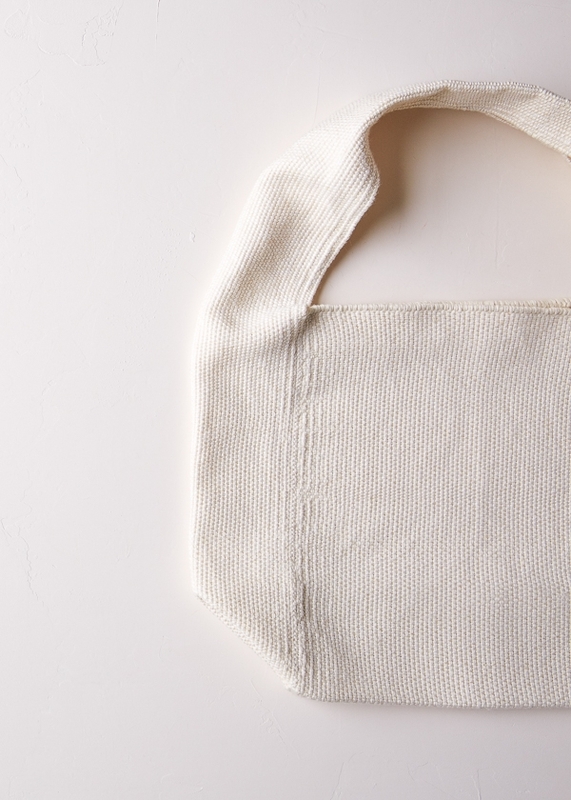 Woven in a nice, dense weft-faced plain weave, you sew the two strips together to create this sturdy boxy tote. For the warp we used our Cotton Pure and for the weft our Field Linen, both made for wear. Use them together to construct our Two-Piece Woven Bag, shown in three classic palettes: Coral White (shown here), Salt Marsh, and Black Sand. With its seriously chic shape and pretty fringe detail on the inside lip, we love the freshness and originality of this little beauty. It’s also pretty amazing what you can make with your own two hands! 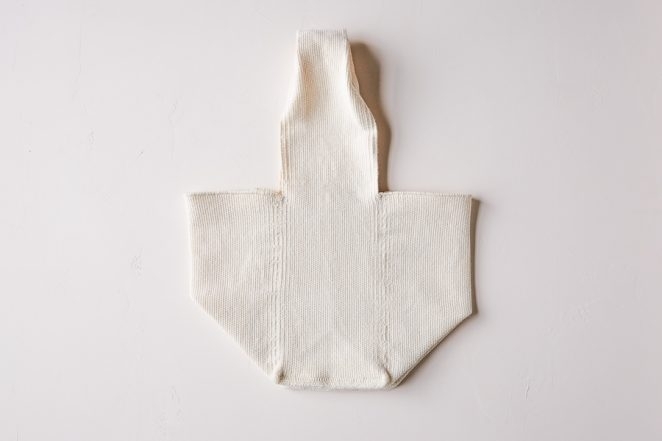 Designed for Purl Soho by Jake Canton. 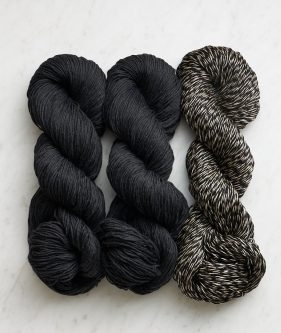 Warp Yarn: 2 skeins of Purl Soho’s Cotton Pure, 100% Pima cotton. We used Egret White. 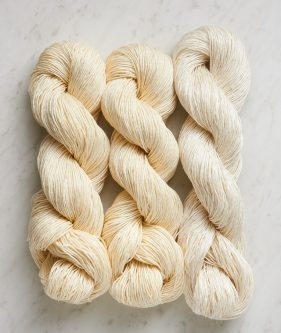 Weft Yarn: 1 skein of Purl Soho’s Field Linen, 100% linen. We used Queen Anne’s Lace. A tapestry needle. We used John James size 20 tapestry needle. A needle threader. We used Muriel Yarn Needle Threader. 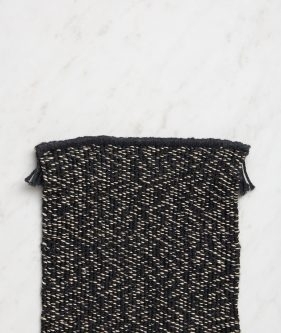 You will weave this bag in two panels that will each require its own warp. The fabric for this bag is very tightly woven. To achieve such a dense fabric beat each row two or three times, using more force than usual. The weft threads in the middle of the woven panel may require some manual beating to keep the threads aligned. 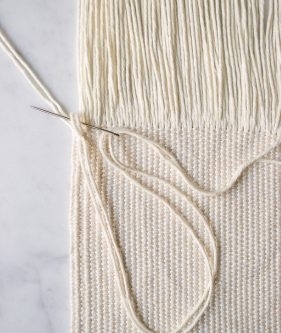 Use your fingers or a Tapestry Beater to beat down the weft in the center of the panel as needed. Cricket Looms come with a very user-friendly instructional booklet that walks you through every step of the weaving process, from assembling the loom to tying the fringe. For even more guidance, check out our Cricket Loom Tips. NOTE: One warp end refers to two strands of the Warp Yarn. When warping the loom, thread the warp through every slat and every hole of the reed. 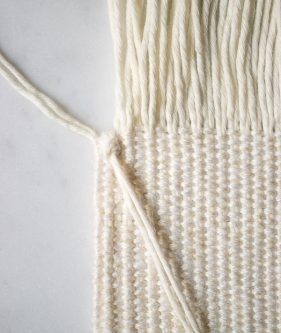 The two strands of yarn are treated as one warp end throughout the weaving. Set up the warping peg 52 inches from the front of the loom, which is at the front edge of the table. 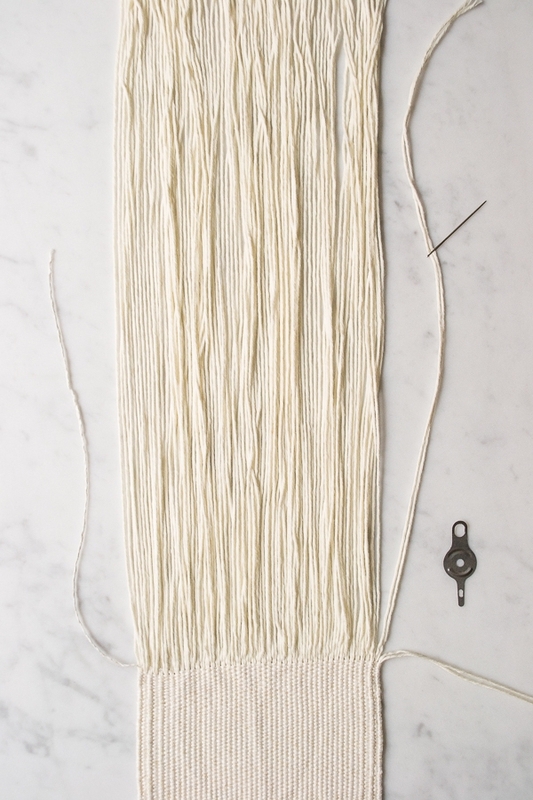 Using the 8-dent reed that comes with the Cricket Loom and the Warp Yarn, begin threading the heddle by pulling the first loop of yarn through the 8th slat from the right end of the reed. Working from right to left, thread the Warp Yarn through the next hole of the dent. Continue to thread every slat and every hole of the reed until you have a total of 86 warp ends, i.e. 43 slats and 43 holes, each threaded with 2 strands of yarn. Follow the Cricket Loom instructions to wind the warp onto the back beam and tie on. Ignore the instructions for threading the warp through the reed. For this project, there is no need to do this step since you already threaded the reed. To finish, tie the warp onto the front apron bar, leaving about 12 inches of loom waste yarn for finishing. 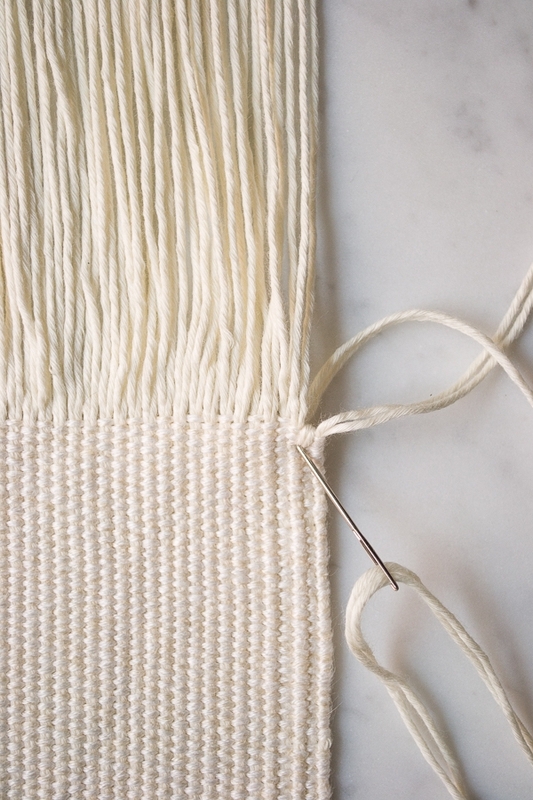 With scrap yarn, weave a couple of inches until the warp threads are evenly spread out. 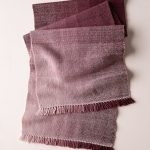 Continuing with the Weft Yarn, weave in weft-faced plain weave for 25 inches, beating each row with extra vigor two or three times to create a weft dominant plain weave (see Notes). Cut the Weft Yarn, leaving a 15-inch tail for finishing. Cut the Warp off the loom leaving at least 12 inches of warp for finishing. 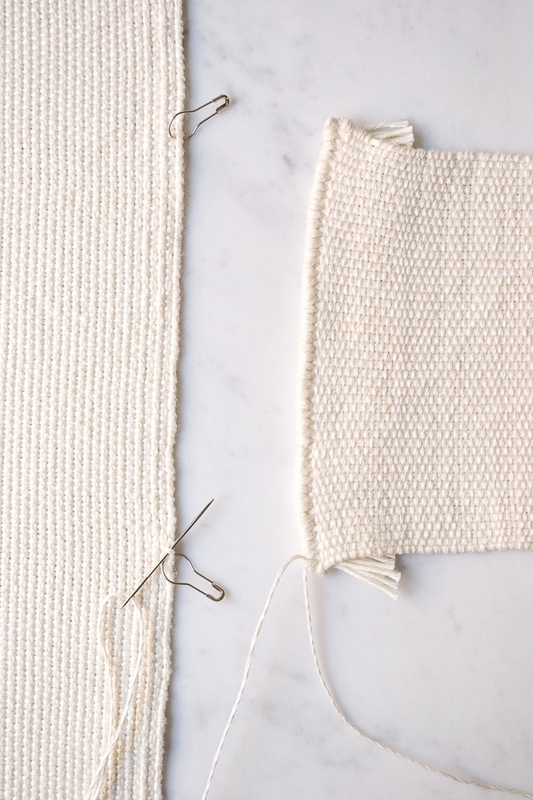 NOTE: As for the Front + Back Panel, one warp end refers to two strands of the Warp Yarn. When warping the loom, thread the warp through every slat and every hole of the reed. The two strands of yarn are treated as one warp end throughout the weaving. Set up the warping peg 65 inches from the front of the loom, which is at the front edge of the table. Using the 8-dent reed that comes with the Cricket Loom and the Warp Yarn, begin threading the heddle by pulling the first loop of yarn through the 18th slat from the right end of the reed. Working from right to left, thread the Warp Yarn through the next hole of the dent. Continue to thread every slat and every hole of the reed until you have a total of 48 warp ends, i.e. 24 slats and 24 holes, each threaded with two strands of yarn. Follow the Cricket Loom instructions to wind the warp onto the back beam and tie on. Omit the instructions for threading the warp through the reed, then tie onto the front apron bar, leaving about 12 inches of loom waste yarn for finishing. Weave as you did the Front + Back Panel for 37-inches. First establish which side of the Strap Panel will be the outside of the bag, i.e. the right side, and which will be in the inside of the bag, i.e. the wrong side. Thread a tapestry needle with the second warp end from the right (remember that this is 2 strands of the Warp Yarn). With the right side facing you and orienting the Strap Panel vertically, insert the tapestry needle, from right to wrong side, 6 weft rows down and in line with the threaded warp end. 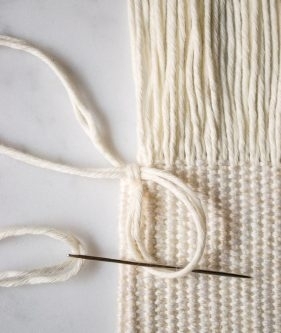 Bring the tapestry needle, from wrong to right side, up over the top of the Strap Panel and insert it back into the same spot as the previous step. 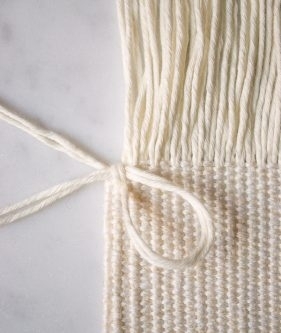 Make sure the 2 strands of Warp Yarn are neat and untwisted, and do not pull them tight. Instead, leave a small loop. Turn the Panel over, and insert the needle from right to left through the loop you just created and pull through, leaving another small loop. Pull on the second loop to tighten the first one. 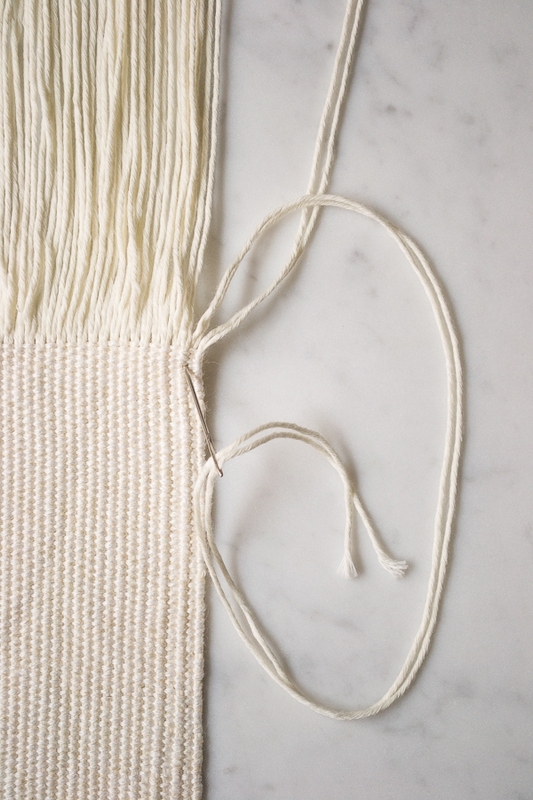 Now thread the tapestry needle through the remaining loop and pull tightly to create a small knot. If the knot is sticking out a little, pull each strand of the Warp Yarn individually to tighten up the knot so it’s nice and tidy. Flip the Strap Panel over, right side facing you, and continue wrapping and tying each warp end, moving from right to left until the last warp end. Now all the warp ends are secure except the first and last ends. For the first and last warp end, repeat the knotting technique, but instead of bringing the needle over the top of the Panel, bring it around the selvage side. Weave in the Weft Yarn tail. Repeat this process with the other end of the Strap Panel and with both ends of the Front + Back Panel. Once all edges of the Panels are finished, soak the Panels in warm water for about 15 minutes, squeeze out the excess water, and lay them flat to dry. Cut the warp ends, leaving a 1-inch fringe. Lay the Front+ Back Panel flat with the right side facing you, oriented vertically. 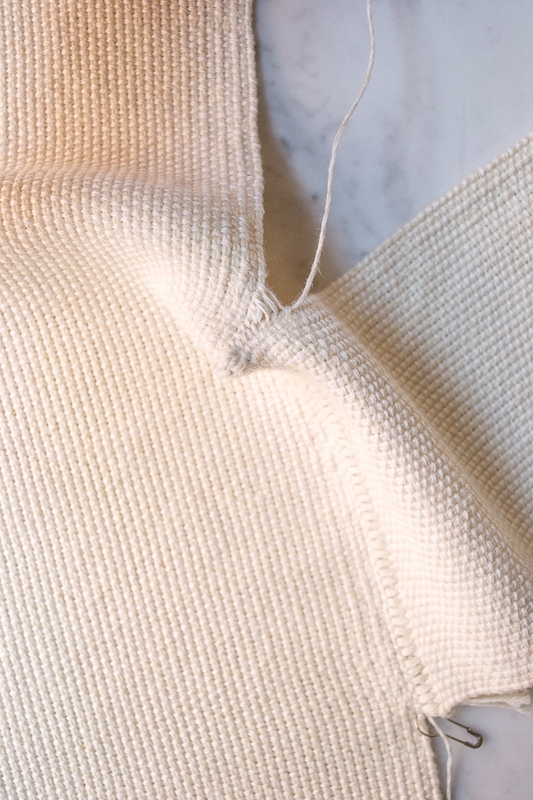 Place a safety pin or stitch marker 10 inches from the top edge on both the right and left selvages. Then do the same 10 inches from the bottom edge.This marks 5 inches at the center of the Panel, which will become the base of the bag. With the right side of the fabric facing you, align one end of the Strap Panel with the 5-inch center space of the Front + Back Panel at the right selvage. Step 1: Thread a 2-yard piece of Weft Yarn onto a tapestry needle. Sew the needle through the first wrap end at the bottom edge of the Strap Panel. Leave a 30-inch tail for seaming later. Step 2: Sew the needle through the first selvage stitch directly above the marker on the right edge of the Front + Back Panel. Step 3: Sew the needle through the next wrap end on the Strap Panel, directly above the one from Step 1. Continue seaming the two Panels back and forth like this until you have seamed across the entire end of the Strap Panel. Do not cut the yarn. 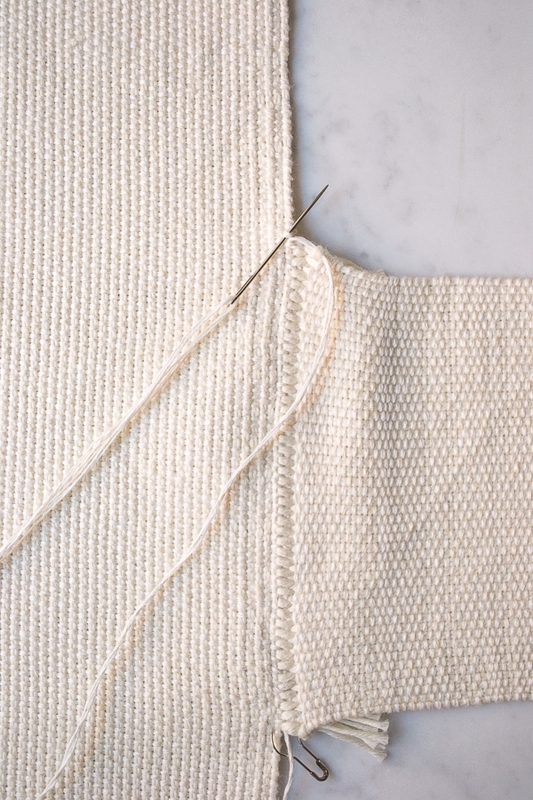 NOTE: Just like mattress stitch seam in knitting, the seaming can be left loose and then pulled tight periodically as you progress. 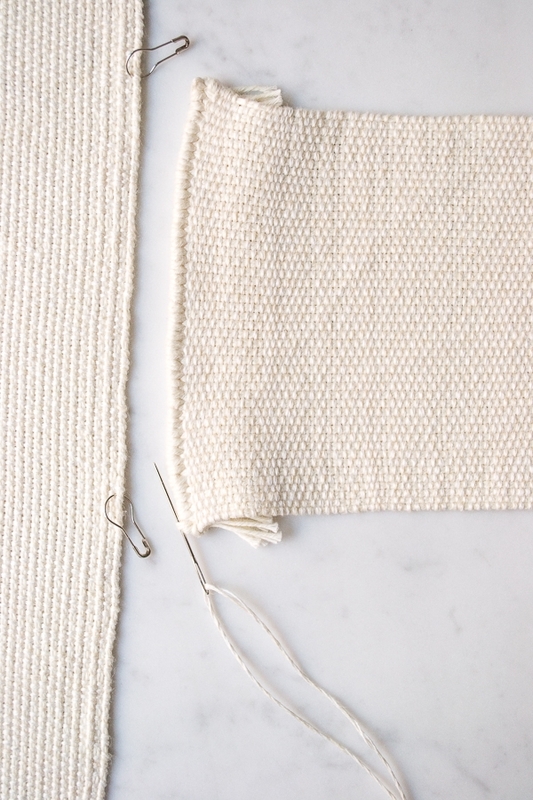 With the same yarn threaded on the tapestry needle, continue by mattress stitching the top edge of the Strap Panel to the right selvage of the Front + Back Panel. This will create a crease that becomes a corner. 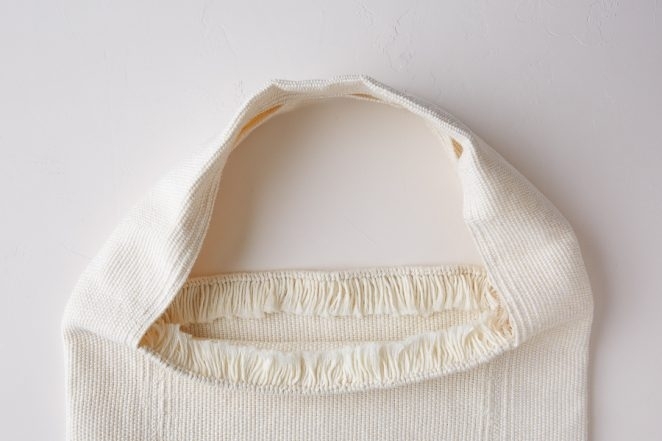 Once you reach the top of the Front + Back Panel, stitch through the top corner 2 or 3 times to tack it down. Then insert the tapestry needle into the warp ends at the top inside edge of the bag, leaving a small loop. Insert your tapestry needle though the loop and pull tight to create a knot, the same way you created the knots for the warp ends. Weave the end into the seam. Thread the 30-inch tail that was left at the start of the Strap Panel seam onto a tapestry needle. As for the first corner, mattress stitch the bottom of the Strap Panel to the remaining right selvage of the Front + Back Panel. Finish as before. One side of the bag is now seamed! Align the other end of the Strap Panel with the 5-inch center space on the left selvage of the Front + Back Panel. Be careful not to twist the Strap Panel! 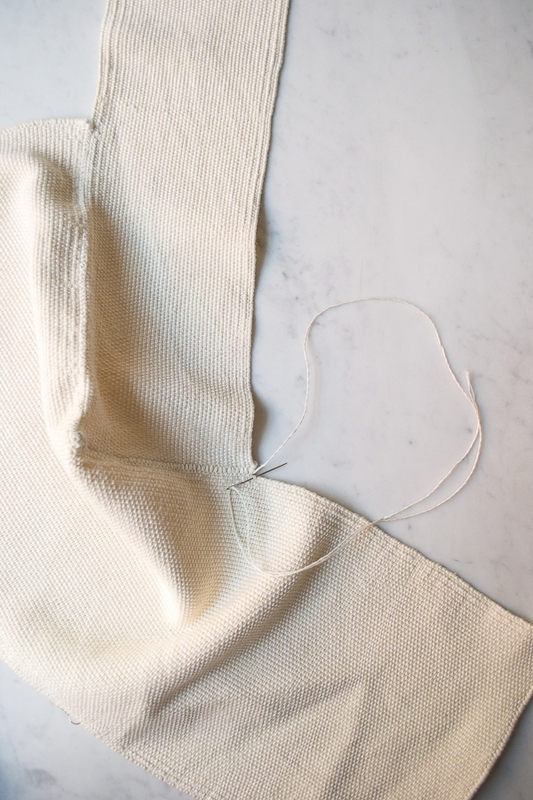 Repeat as for the right selvage, seaming first the end of the Strap Panel, then turning the first corner and seaming to the top, then turning the second corner and seaming to the top. 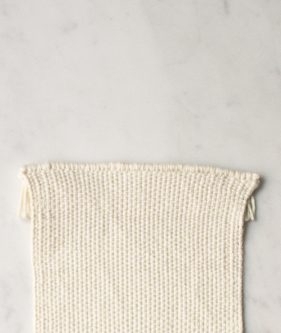 Cut a 12-inch piece of the Weft Yarn and thread it onto a tapestry needle. Find the top center of the Strap Panel (about 8 1/2 inches from the top of the bag) and place a marker. Fold the Strap inward at this point, aligning its edges. Starting 1 inch from the marker, whipstitch the two edges together for 2 inches. This makes a folded section at the center of the Strap that is half as wide as the rest of the Strap. Weave in all remaining ends, then give the bag a second blocking to straighten out the seam, as well as relax the fabric. All done! How ’bout a knitted version? Thanks for reaching out! 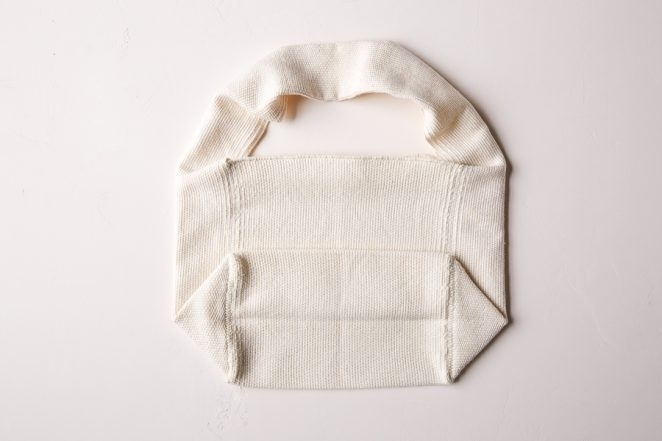 We do not have a knitted version of this bag but we will keep your request in mind for the future! 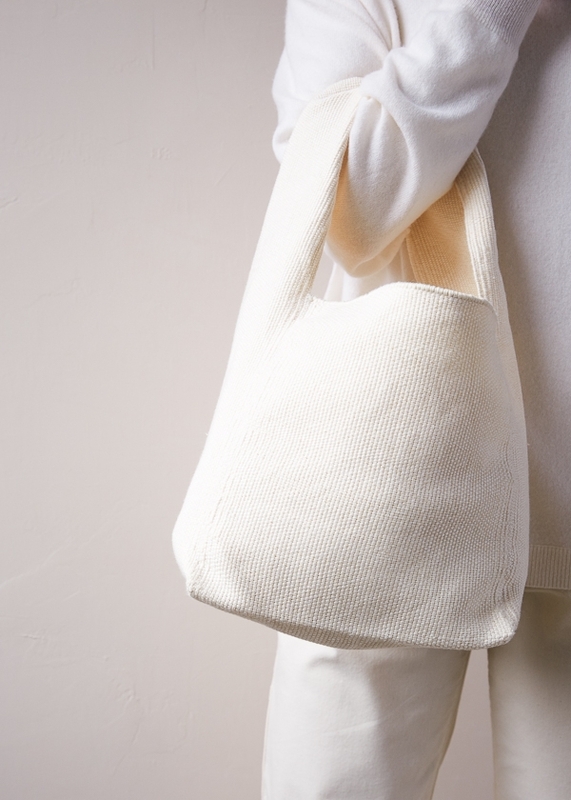 Although it is a different style of bag, if you would like to knit a tote out of either Field Linen or Cotton Pure, you might like our Knit Tote pattern. 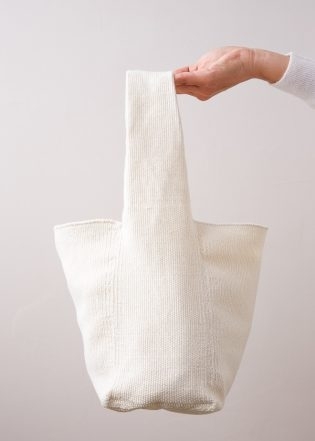 Would love to see this style of tote in fabric form! Thanks for writing in! I actually think it would be quite easy to adapt this for use with a heavyweight fabric such as canvas or denim! If you check the “Size” section of the instructions, you will see the finished measurements of each woven panel of the bag. 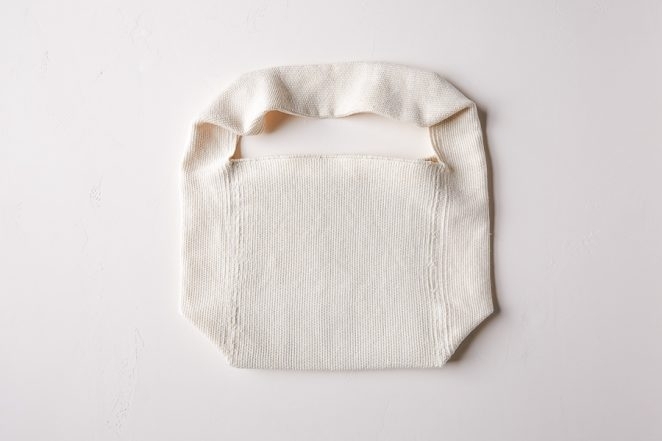 You could cut rectangles to match these dimensions plus a seam allowance from your fabric, hem the long edges of the strap panel and top edges of the front and back panels, and then assemble the bag following the rest of our instructions. Our Apple Picking Tote is assembled in a similar fashion and may give you some more ideas! Unfortunately we don’t have a knitting pattern for this at the moment but we will keep your request in mind for the future! Although it is a different style of bag, if you would like to knit a tote out of either Field Linen or Cotton Pure, you might like our Knit Tote pattern. Thanks for your interest in the pattern and for writing in! Wonderful bag! Will weave it on my 30 in floor loom. Wow! Wonderful bag! Will try it on my 30 in floor loom! WOw! I would like to make this bag in denim blue. 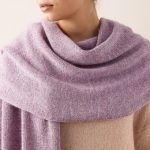 Would it work if I wove it with Cotton Pure for both warp and weft? Thanks for reaching out! You can certainly use Cotton Pure for both the warp and the weft but it will take a bit of work to make the pattern work for this combination! 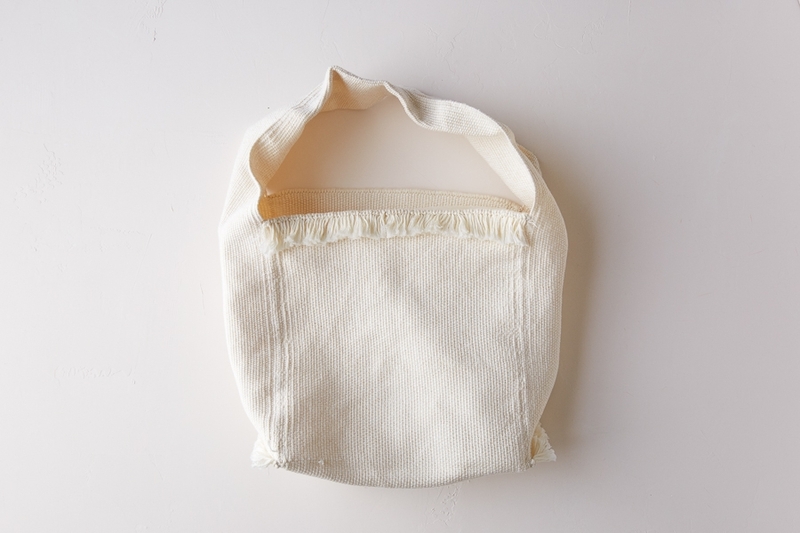 The fabric made using the Cotton Pure as warp and Field Linen as weft allows the Field Linen to pack down due to it being thinner and thus makes the densely packed fabric of the bag. By substituting either the warp or weft with the other yarn it might make it harder to pack down creating a slightly more open weave or possibly a tighter weave. It would be hard to say without trying it first. The other thing to consider is that altering the warp or the weft yarn will most probably alter the width of the panels. Again, it would be hard to say by how much without weaving up a sample to see the quality of the fabric. I love all of your patterns and this looks like the perfect challenge for me. What is the total amount of yarn used? Thank you for reaching out! 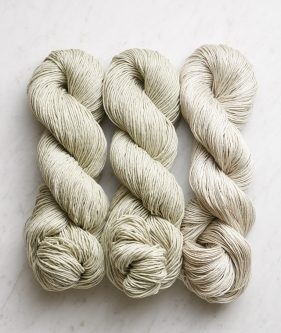 We used approximately 526 yards of Cotton Pure and 295 yards of Field Linen. I hope this helps and let us know if you have any further question! I couldn’t resist sewing the bag with a remnant upholstery fabric. I didn’t think ahead to add seam allowances to your original dimensions so the bag is somewhat small. I did a lot of seam edge finishing and some top stitching to make a very nice bag. Will likely use it to tote knitting projects. I would add a photo if it were possible. 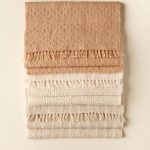 Could the weft be done in linen as well? Thanks for reaching out! You can certainly use Field Linen for both the warp and the weft but it will take a bit of work to make the pattern work for this combination! 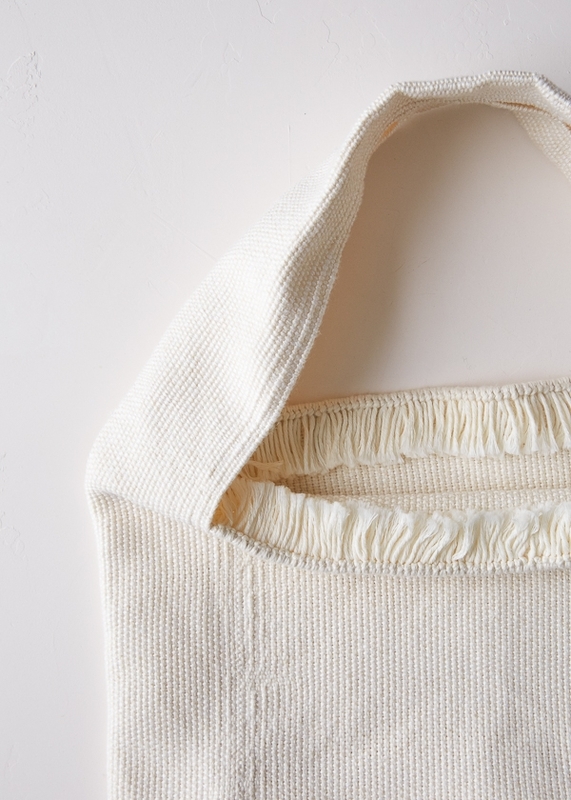 The fabric made using the Cotton Pure as warp and Field Linen as weft allows the Field Linen to pack down due to it being thinner and thus makes the densely packed fabric of the bag. By substituting either the warp or weft with the other yarn it might make it harder to pack down creating a slightly more open weave or possibly a tighter weave. It would be hard to say without trying it first. The other thing to consider is that altering the warp or the weft yarn will most probably alter the width of the panels. Again, it would be hard to say by how much without weaving up a sample to see the quality of the fabric. Hello. I am very excited about this pattern and purchased the kit. I am a brand new weaver and I have the 15″ Schacht loom. Do you by any chance have any more detailed advice of accomplishing the ‘double warp’ properly? I am really struggling with that step as I have just made stash scarves thus far 🙂 Kind thanks for any advice! Thanks for writing in! For the warp of this lovely bag, you will want to warp in a very similar fashion to how you would warp your loom for a standard weave. However, instead of pulling the yarn through just the slats and then cutting the warp and pulling the second thread through each hole, you will be pulling the yarn through each slat and each hole as you warp. It actually ends up being a little less work than traditional warping as all of the work is done up front! Does it matter if I end up with more than 12 picks per inch? Thanks for reaching out! More picks per inch will result in a stiffer fabric and will use more yarn. The fabric here is already on the stiffer side but if you do like the feeling of the stiffer fabric and have a bit more yarn, you can certainly work with more pick per inch! I am getting ready to warp my loom for this project and have a question about measuring for the warp length. I see in your instructions to measure the 52″ from the side of the loom at the front. I have always measured from the back apron. Was this taken into account for this particular project? Just want to make sure i have enough to make it properly. I’m having trouble understanding the directions for hem finishing for the panels and strap. Does this type of finishing have a name so I can check on line for a demonstration. It appears to have a nice clean look. I’m looking forward to completing the bag. Thanks for reaching out! I am not sure that there is a name for the full instructions for this section. We are using, essentially, a mattress stitch here but using the it in a bit of a different fashion. I find that when I am struggling with a new technique that it helps to talk through it out loud. While I feel a bit silly, I find it to be so helpful! I’m in process of weaving this lovely purse. I can’t seem to find instructions for finishing (hemming) the woven panels. Should I follow the same instructions as for the strap panels? Thanks for reaching out! 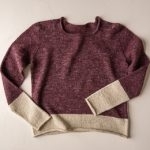 Yes, you should hem the front and back panels in the same manner as the strap panels. The instructions to do so are located towards the end of the “Hem the Woven Panels” section of the pattern, but it is just one sentence that is easy to miss! I would like to learn how to weave. Can you suggest the best way for me to do that? How exciting! The best way to learn is to take a class. If you are local to our New York store you can check out our class schedule here. If you are not in the New York City area I would suggest doing a quick google search to see if there are any local weaving classes in your area. There are also lots of books and youtube videos that are very useful for getting you started. My favorite book for learning how to weave on a Rigid Heddle Loom is Inventive Weaving on a Little Loom By Syne Mitchell. I hope this helps and happy weaving!